My Orange Brompton: Off to the Brompton Factory Ride!! 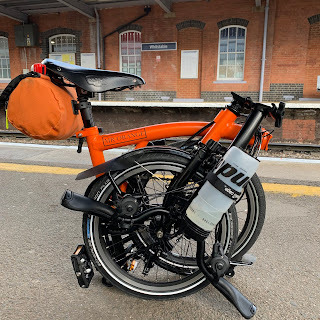 I am blogging as I travel to the Brompton Factory Ride at a secret location. Excited is a bit of an understatement. The weather forecast (a preoccupation with the English) does not look that good. I will be undeterred and carry on regardless. I have brought my trusty Olympus Pen camera which quite possibly will only see action actually inside the factory. I have also brought a GoPro and a waterproof camera (my daughters) just in case. It should be a great day and I am really looking forward to it. Hopefully I will return home with loads of photos and maybe video footage. If I can I will do a full write up later on. simple, yet effective. A lot of times it's difficult to get that "perfect balance" between user friendliness and appearance. I must say you've done a amazing job with this.